Pecan Pie is a perfect match for the Holiday season. These scrumptious Nut Pies are not too sweet not too tart, but gooey mix of a fine filling combined with the crunch of pecans. However, throughout many years as The Muffin Lady I have received phone calls, emails, and personal conversations related to Pecan Pie disasters when baked at High Altitude! Yes this is related to the altitude and thin dry air which tends to cause various products to rise beautifully and then collapse, sink or flatten out. And yes, the solution to this issue is to simply avoid adding all the filling. To do this first add an extra tablespoon or two of excess pecans on top of the others in the pie shell and then pour the filling over the pecans just until it reaches the bottom of the top crust/rim. IF a few pecans can be seen sticking out of the filling that is how it should look, rather than appearing as if drowned in the gooey filling! I always leave a couple tablespoons of the filling in the bottom of the mixing bowl, or pot (including the recipe below) to ensure that my Pecan Filling does not floweth over the Pie Crust! TIP: Occasionally I will make a few mini Pecan Tassies out of the left over filling enabling me to take a taste before serving. Other complaints have been Rock Hard Pecan Pies, Too Gooey Pecan Pies and those that are much Too Sweet Pecan Pies, hence unpalatable! I am not a culinary scientist so I do not know why the filling can get too hard, yet too gooey implies too much filling combined with pecans and too sweet indicates that the combination of brown sugar and sugar and corn syrup is not accurate. Also some may use Dark Corn Syrup which tends to be sweeter than Light Corn Syrup. FYI the Corn Syrup used is not High Fructose which contains a higher amount of sugar and is used to preserve and flavor too many prepackaged foods, rather it’s just real corn syrup produced from breaking down corn starch! 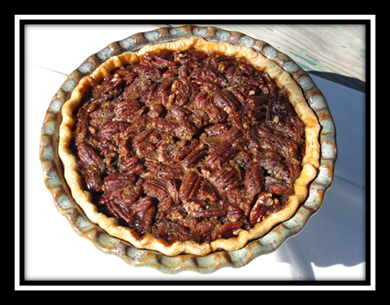 To solve any question that you may have for baking the best and most delicious Pecan Pie for this Holiday and many more to come, Yes I do have a great recipe. It is not too sweet, not too tart but just Right. BTW: No This Pie Recipe Has Never Exploded in My Oven and I have been baking it for a few decades to date! 1. Prepare crust and gently place it into a 9-inch pie pan and flute the edge. 2. Place all the pecans into the prepared pie crust and set aside. 3. Combine the brown sugar, sugar and cinnamon in a medium bowl until there are no lumps. 4. In a mixing bowl, beat the eggs for 30 seconds, add the corn syrup and vanilla. 5. Add the sugars and butter to the egg mixture and stir together until all the ingredients are fully incorporated. 6. Pour the mixture over the pecans. 7. Bake for 50-60 minutes until the filling is puffy or until an inserted knife comes out clean. * Allow to cool completely prior to serving. Thank you very much for your advice. I made the Oat muffins from your book using the recommended proportions of buckwheat and quinoa flours and they turned out delicious! I found the gluten free flour combination to taste similar to a whole wheat flour. The only adjustment I needed to make was substituting an equivalent amount of konjac powder (also called glucomannan powder) for the xanthan gum since xanthan gum causes adverse digestive issues for me. It is so wonderful to be able to bake successfully once again! Its my pleasure to help! and If you ever have another questions, please do not hesitate to ask me. Also, (just because I made it last night) try the Cherry Peach Crisp—such is a personal favorite recipe which helps to warm everything around it in these colder months. I made this pie today using a cassava flour crust. The filling was good but the crust was awful: under the filling the crust was like mush and the exposed crust fluted around the edges was overcooked and hard even though I used a pie shield to keep it from overbrowning. I was disappointed in that I had made cassava flour tortillas earlier in the week and they had turned out well. What kind of gluten free pie crust do you recommend? I have seen that you use buckwheat and quinoa flours in other recipes, Does this flour combination work well for a pie crust as well? I use my own recipe: BTW Under the Substitutions Chapter in my Baking at High Altitude Cookbook you can find my subs for flour. I have been using a Buckwheat/Quinoa combo since the early 80’s when I was a Special Ed Teacher. It works fabulously!!!!!!! 1/2 cup of Shortening plus 1 hefty Tablespoon. 1. Sift together the flour and salt. 2. Add the water to ¼ cup of the flour/salt combination and mix to make a paste. little beads begin to form. 5. Form the dough into a flat ball and roll out onto a floured surface. 6. Turn the dough over carefully two or three times during the rolling process. 7. Gently lift and fit the dough into the pie pan. 8. Trim off any excess dough and either flute the edge or press the edge with the tines of a fork. Then fillthe pie shell and bake!